2014 World Cup: Is Being Defending Champion Bad Luck? 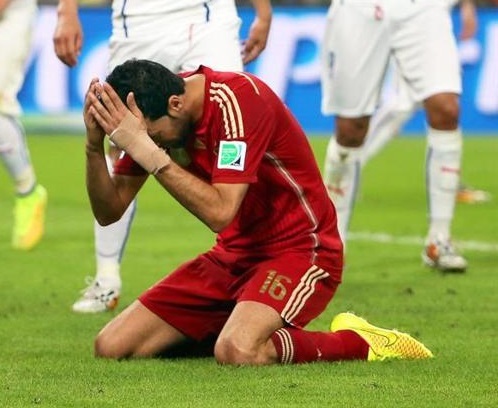 Spanish player Sergio Busquets is devastated after Spain’s loss to Chile. That loss prevents Spain from advancing past the Group Stage. It was something nobody saw coming. Spain entered this World Cup as the reigning champions. Ever since their win of the Cup, they’ve had an impressive record with winning Euro 2012, Runners-up to Brazil at the 2013 Confederations Cup, and an impressive streak of 39 wins, eight draws and six losses in the games they’ve played since World Cup 2010. However something went wrong in their game against the Netherlands on June 13th. At first, it looked like Spain would command an early lead with a penalty goal scored by Xabi Alonzo in the 27th minute. Then things turned for the worse as the Netherlands, whom Spain played against in the 2010 World Cup final, came back first with a goal from Robin van Persie in the 44th minute, followed by four more goals from the Netherlands including a second from van Persie and two from Arjen Robben. The score 5-1 was Spain’s biggest loss in a World Cup game since 1950. Coach Vicente Del Bosque reassured fans that Spain will be ready in their next two games. Spain’s next opponent was Chile in the Maracana Stadium. Chile already had beaten Australia 3-1 in their World Cup opener. You’d expect Spain to be hungry for a win after their big loss to the Netherlands. However things went completely unexpected for Spain. Chile’s Eduardo Vargas drew first blood by scoring in the 20th minute. Then just before the first half was about to end, Charles Aranguiz gave Chile another goal to give them a 2-0. There was no more scoring in the second half. As the final whistle blew, Chile not only won the match against Spain but found themselves advancing to the Round of 16 through acquiring their second win. Just hours earlier the Netherlands won their match against Australia 3-2. With that being their second win, the Netherlands were guaranteed a spot in the Round of 16 too. Spain found itself with two losses and with only one game left in the Group Stage, all chances of qualifying for the Round of 16 had fallen out of their hands. 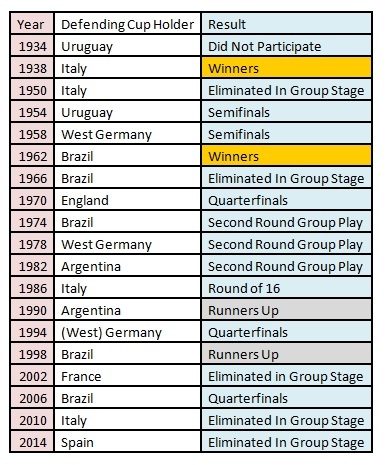 As you may have noticed in the chart, five defending champions in the history of the World Cup have failed to advance past the opening Group Stage, with Spain being the latest. The craziest thing about this is that Spain’s incident is actually the third time in the past four World Cups that the defending champion would face the end of the road in the Group Stage. Seeing a defending champion of a major sports event falter is very common in sport. I’ve seen it happen many times before in terms of the professional sports scale and even in the Olympic arena. The World Cup is no stranger to that, obviously. I myself witnessed the struggle of the defending World Cup holder first in 1990 when Argentina lost to Cameroon 1-0. Cameroon finished on top in their group while Argentina finished third and was able to qualify to the Round of 16 because the World Cup consisted of 24 countries and third-placers were eligible for wild card berths. Argentina then came alive after that and went on to qualify for the finals. The second time I noticed was back in 1994 when Germany was the defending Cup holder. For the record, Germany is the team I cheer for at the World Cup. They too had an excellent record of consistency. Then it was their quarterfinal against Bulgaria. they scored first but Bulgaria came back to win 2-1. Bulgaria went on the semifinals while Germany packed sooner than expected. I’ve watched many more World Cup since and I’ve payed close attention to how the defending champion would do. It’s interested that of the eighteen times the defending champion competed at the World Cup, only twice were they successful to repeat. Even now seeing how Spain is the fifth defending Cup holder ever and the third in the past four Cups to be eliminated in the Group Stage makes me wonder if there’ starting to be a curse with the defending Cup holder. I mean it’s no question the defending Cup holder would face the pressure to win. You have the World spotlight and the adoration of a nation behind you. Not to mention your #12 ranking on FIFA’s chart at stake too. It’s easy to see in situations like those in which the reigning champions would falter. Sometimes it could be overconfidence. The team might think they’re #1 and sometimes forget to play well and pay for it in the end. Or it could be that the team was not all there mentally. That could happen. Even though Del Bosque has been coach of Spain since 2008 and hugely responsible for its success, it is possible for even the best teams to falter. Whatever the situation, Spain will return back home after they play Australia in what will be their last Group Stage game. They may play badly or they may play spectacularly as if they have one last thing to prove. Whatever the situation, Spain will have to regroup and train again as a national team from scratch. It’s highly likely Del Bosque will be dropped as head coach. Who will replace him is a big question right now. Spain’s first chance to prove itself after the World Cup will be September 4th in a friendly match against France whom themselves choked in 2002 as defending Cup holders. Winning the World Cup may be everything for the football players in Brazil. However for those that win on July 13th, it could be a bad omen for the next World Cup. I don’t want to get superstitious but it is tempting right now. UPDATE: For my 2018 update, click here.